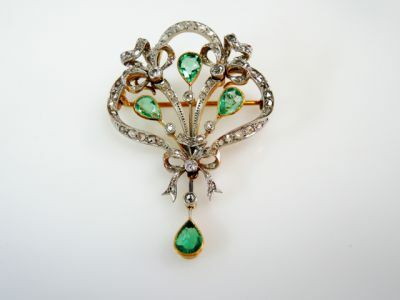 A beautiful 18kt yellow gold with silver top antique brooch that can also be worn as a pendant with 4 pear facetted cut light intense green emeralds, est. 2.32ct; 7 old European and rose cut diamonds, est. 0.28ct (clarity:SI-I1 & G-H colour) and 69 rose cut diamonds, est. 1.88ct (clarity:SI-I1 & G-H colour).